BENGALURU (March 14): Most Southeast Asian stock markets edged up in thin trade on Tuesday, as investor sentiment remained subdued ahead of a two-day policy meeting of the U.S. Federal Reserve that is widely expected to raise interest rates. Fed Chair Janet Yellen has signalled that the U.S. central bank would likely hike rates at its March 14-15 policy meeting. "Markets are mixed for the time being ahead of the Federal Reserve meeting," said Manny Cruz, an analyst at Manila-based Asiasec Equities. "There is a lot of uncertainty at the moment, which is what's holding back the positions of most markets." In Indonesia, shares hit a 4-month high, led by financials and energy stocks. An index of the 45 most liquid stocks was up 0.6%. Bank Central Asia touched a near 5-month peak, while conglomerate United Tractors rose as much as 2.9%. "The construction sector improved from a year ago, which has boosted sentiment in Indonesia," said Cruz. "There is also a rally in mining stocks, as coal prices have rebounded lately." Philippine shares rose as much as 0.6%, led by industrials. Conglomerate SM investments rose as much as 2.5%, extending gains from the previous session. Food and beverages producer Universal Robina rose as much as 3.2%, its biggest intraday percentage gain in nearly two months. Vietnam rose slightly, with utilities and consumer staples leading the gains. Petrovietnam Gas joint Stock rose as much as 3.1%, while food processor Masan Group rose to its highest in more than two months. Singapore fell 0.2%, as real estate and consumer staples lost ground. Property developer CapitaLand and Thai Beverage both fell as much as 1.6%. 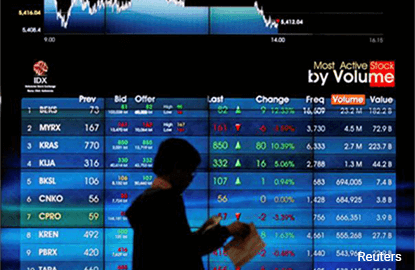 In Asia, MSCI's broadest index of Asia-Pacific shares outside Japan was up 0.3% as of 0450 GMT.